As a practicing educator for the past 20+ years, I still, on occasion, get accused of having brain damage. 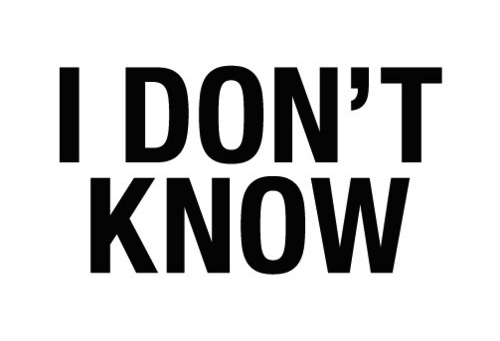 While this may contain some truth, one thing I have most-certainly learned as a result of spending practically my entire life in school is... "I don't know" is not only a great answer, from a teacher's perspective, it just might be, at times, the best answer. In this age of abundant information and connected networks, it is more important for teachers to ask the right questions - rather than having all of the right answers. The pressure to be the expert in the classroom is removed when teachers shift the responsibility of learning to the students, and their networks. Once teachers assume the role of lead learner in the classroom, "I don't know" can be the spark that prompts a cooperative investigation to develop essential learning dispositions, collaborative research skills, and meaningful, helpful solutions to authentic problems stemming from those high quality questions mentioned previously. Maybe my brother and I weren't brain damaged after all. Maybe we were just too advanced for our own good. "I don't know"